At regular intervals, I check eBay for the authors and artists whose works I collect. Over the last decade, this “habit” has made it possible for me to add to my collections of first and early editions of the Elizabeth Gaskell; acquire foreign-language versions of my Aunt Ethel’s first book, Rhymes for Kindly Children; strengthen my collection of prints by J. J. Lankes AND Percival Gaskell; and acquire periodicals with short stories by Marjorie Kinnan Rawlings. As some of you may recall, I even acquired a letter written by Elizabeth Gaskell – a letter I published in the Gaskell Society Newsletter and subsequently donated to Manchester University’s John Rylands Library for their collection of Gaskell correspondence. I also have been able to acquire all but one publication authored by Nancy Cox-McCormack, the artist on whom I wrote my thesis for my M.A. in Art History. 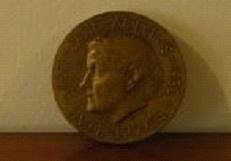 Last month, I was trolling through my routine list of people on eBay, and there, looking out at me from eBay was a copy of her bas-relief portrait of Jane Addams, founder of Chicago’s Hull House. I was stunned! Cox-McCormack had been chosen to model this memorial portrait sculpture as a commission in 1935. It consisted of two separate discs, one portraying Jane Addams; the other portraying Hull House. The first castings of the two discs were mounted on ebony board. The Hull House casting was initially displayed in the dining room of Hull House. 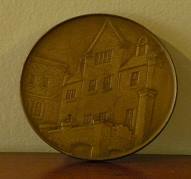 Reduced-size bronze copies (3 inches in diameter) were also struck to use as a fund-raiser for Hull House. This version has the portrait of Addams on one side and the image of Hull House on the back side. I had seen copies of this smaller, two-sided version at the Herbert F. Johnson Museum of Art at Cornell University, Ithaca, IL and at the Peace Collection at Swarthmore College, Swarthmore, PA. I admit that it isn’t her best sculpture (I think her Mussolini and her Gandhi are), but it is the only one to come up for sale since I have been paying attention. No one had bid on the medallion and the seller had provided a “Buy Now” option. I INSTANTLY availed myself of that option. 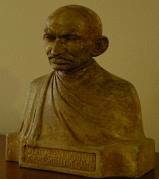 I am now the proud owner of TWO Cox-McCormack portrait sculptures: the Mohandas ‘Mahatma’ Gandhi that I inherited AND the Jane Addams that I purchased. 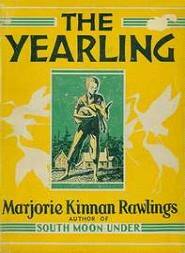 I am often surprised by how many of my well-read friends and acquaintances are not familiar with the American author Marjorie Kinnan Rawlings. 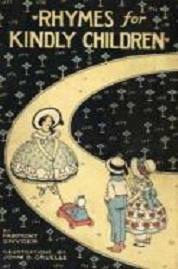 At the same time, most of them are familiar with her novel, The Yearling, a bildungsroman set in the late 19th Century. Last year (2013) was the 75th anniversary of the publication of this Pulitzer Prize winning novel. Throughout Florida, “The Year of The Yearling” (as it was labeled) events were organized to celebrate this benchmark. Exhibitions and lectures were mounted at the Matheson Museum in Gainesville, Florida; a day-long symposium was held at the University of Florida’s Smathers Library (the repository of many of Rawlings’s papers, manuscripts and correspondence); multiple free showings of the film starring Jane Wyman and Gregory Peck were offered; and a broad range of special programs (guided trail walks, garden lectures, concerts etc.) were held at Rawlings’s home (Cross Creek), now designated an “Historic State Park” property. While the celebrations have ended, if you’ve not read this novel, you might find it an interesting introduction to this “minor” American author and her rural Florida world. Last October, I was trolling on the Internet, looking for some context for some of my Aunt Ethel’s early political activities on behalf of animal rights when I spotted a profile of her on the Web site for the National Museum of Animals & Society. I had never seen this entry before; nor had I previously heard of this Los Angeles Museum. I clicked on the URL and was taken to a 2012 page featuring my aunt’s book, Rhymes for Kindly Children illustrated by John B. Gruelle (author of the Raggedy Ann books) and profiling a sampling of her work in the Humane Movement. I contacted them, filled in some missing details on her life and offered to provide them with a few photographs and a first edition of the book (an offer they gladly accepted). I am pleased that her efforts on behalf of animals (especially cats) have been recognized by a new generation of animal rights activists. I have just updated my Gaskell bibliographic supplements – a little later than planned, but it has been one of those Robert Burns months! They now can be accessed via the “Gaskell Bibliography” tab on my Web site. Permit me to make a quick comment/apology: after almost twenty-five years of working on Gaskell bibliography, I have discovered that I have SO totally internalized the 6th edition of the MLA Handbook that adapting to the formats mandated by the 7th edition is exceedingly time-consuming (generally requiring more time to format the citation than to locate the source). I AM working on it but when the source includes a “Preferred Citation” format that differs from what the MLA mandates, it gets more complex than it should have to be. For the 2002-2011 sources, I am “fixing them” systematically (and time-consumingly) as I write the annotations (which I am not posting). For the 2012-2014 period, I am trying to make them conform to the 7th edition but it IS a work in progress! My short-term goal is to bring sources to your attention but please DO double-check MLA’s citation format rather than rely on mine. As I have done previously, I have listed the newly-identified sources separately AND integrated them into the comprehensive listings for each of the two time periods covered (2002-2011 and 2012-2014). Much to my surprise, I located ten sources for 2002-2011 that I had not previously identified. The primary reason for this is that a growing number of theses are being scanned in their entirety and made available on the Internet, either by the universities at which the degree was earned or on a relatively new Web site entitled “Open Access Theses and Dissertations”. Universities in America and Great Britain are in the forefront of this initiative, though several universities in continental Europe, the Middle East and Asia have also added scholarship authored by their students. The sole Master’s thesis on Gaskell to surface for this earlier period was written at Vienna University. While some of the works examined in these eight pre-2012 sources are those that traditionally attract a lot of attention (Cranford, Mary Barton and North and South), others are less-commonly the focus of critical analysis: “Disappearances”, “Lizzie Leigh” and Lois the Witch. Sources identified since last October that were published between 2012 and 2014 present some very interesting patterns. Firstly, the reprinting of previously published sources that I noted in my last newsletter has continued. This time, the titles with chapters on Gaskell reprinted in paper and/or Kindle include such dramatically older classics as Sir Arthur Quiller-Couch’s 1927 publication Charles Dickens and Other Victorians and the 1910 book, Women’s Work in English Fiction from the Restoration to the mid-Victorian Period by Clara Helen Whitmore. At the same time, a growing number of books published in paper within the last ten years are being reissued without revisions as e-books and many new titles are being issued simultaneously in paper and electronic form. For this 70-year old librarian, there is something almost sacred about print books, especially old, leather-bound books. Given a choice of paper or e-book, I still acquire the paper version. At the same time, it is worth noting that I totally understand the appeal of the e-book format. One can carry small library collections in one’s tablet computer. Additionally, based on observing book listings on Amazon, their Kindle versions are cheaper. Here is just one example. Amazon lists three versions of The Cambridge Companion to Elizabeth Gaskell, published in 2007 (hardbound, paperbound and Kindle). The hardbound copy is listed at $109.25, the paperback at $30.39, and the Kindle at $14.49! Perhaps I need to rethink this e-book thing! I have found no new bibliographies or articles presenting new correspondence published since my October update. An examination of the eight new biographical sources documents a slow but steady expansion of our knowledge of Gaskell’s travels, her acquaintances, friends, and family. One builds on the information revealed in the letters of the Gaskell daughters, documenting the lives of William Gaskell and the Gaskell daughters after the sudden death of Elizabeth. Of special interest to me are two articles published in the 2013 Gaskell Journal that focus on Gaskell’s life at 84 Plymouth Grove. One explores the interior of the house (wallpapers and furnishings, examined against the backdrop of the family dynamic); the other explores Elizabeth’s garden, placing it in the context of gardening practices in contemporary Manchester and flower and garden references in her fiction. In light of the impending reopening of Plymouth Grove, these are especially timely. In recently-published literary criticism, all of Gaskell’s novels and novellas are analyzed at least once. A few scholars (Antinucci, Lambert, Mews and Milota) examine all or a significant number of her novels as well as multiple short stories, focusing on particular themes: a label for Gaskell (feminist, social, canonical); health-care providers; the role of women and the meaning of “home”). Cranford, Wives and Daughters, Ruth and Life of Charlotte Brontë are each analyzed by five or six scholars while “The Grey Woman,” Cousin Phillis, Lois the Witch and Sylvia’s Lovers are featured in either two or three publications. This time, the novel that commands the most attention is Mary Barton with North and South a close second, with some articles or book chapters discussing themes shared by both. Scholars analyzing Mary Barton explore unions, violence, motherhood, the home, medical professions, class, paternalism, flower imagery, urban landscapes, the Gothic and Chartism. North and South is explored for its treatment of class, home, unions, women’s roles, social order, economics and intimacy. Two of Gaskell’s works discussed are less frequently examined in terms of “Gaskell, the author” than explored in terms of “Gaskell, the Mother”. My Diary and her poem, “On Visiting the Grave of My Still-Born Daughter” are both included in an analysis of Gaskell’s treatment of her fictional mothers. For people interested in learning about film and theatrical adaptations of Gaskell’s works, I’d like to draw your attention to the book Adapting Gaskell: Screen and Stage Versions of Elizabeth Gaskell’s Fiction, edited by Loredona Salis. The relatively recent AND popular BBC film, Cranford, certainly helped expose many television viewers previously unfamiliar with the novels and short stories of Elizabeth Gaskell to both her fiction and her life. Simply, this collection of well-researched, well written essays documents the long history of Gaskell on the screen and Gaskell on the stage. How delightful! Of the eight new theses that I have identified, one was written at a university in England, two were written at universities in the United States. The other five were written at universities in Sweden, the Czech Republic, Turkey and Taiwan. Clearly, the issues addressed in Gaskell’s fiction have international relevance. In closing, I would like to observe that over the last six months, several people have communicated with me, drawing my attention to publications on Gaskell of which they were aware. In some cases I already had discovered the scholarship they identified; in others I had not. One Brontë scholar (a former colleague at Bloomsburg University) has helpfully sent me photocopies of articles on Gaskell that have appeared in Brontë Studies. I appreciate the assistance of these individuals. Lastly, the Interlibrary Loan staff at Bucknell University have been AMAZINGLY supportive of my work, e-mailing me articles within a day or two of my submission of requests. All are due my thanks. DO let me know if you are aware of scholarship that I have missed.